If you want to really impress guests, definitely try to prepare liquor at home. Drinks these recipes are prepared very quickly, and the result will exceed expectations. Homemade liqueurs – great alternative to the expensive "shop" beverages, while they do not contain any artificial additives or preservatives. 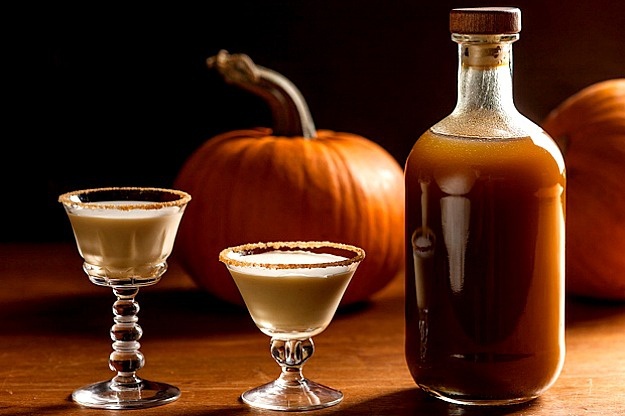 To cook coffee liqueur at home, you will need 2 bottles of vodka, 50 g of natural ground coffee, pinch of cinnamon and a Cup of sugar (with slide). Pour ground coffee Cup of water, add a little cinnamon and put on fire. When the coffee boils, remove it from the fire, cool, pour into a glass jar and close the lid. Take coffee for a day in a dark place. After this time, strain the coffee, add sugar and vodka and heat the mixture so that the sugar is completely dissolved. Strain the drink through cheesecloth to become transparent. Pour liquor bottles and soak 3 days. All fragrant and delicious coffee liqueur you can bring to the table. This recipe for homemade liqueur will satisfy a sweet tooth, because the drink has such a rich and pronounced taste of chocolate that is simply irresistible. Chop 3 tiles of black chocolate and pour 1 liter of vodka. The resulting solution steep for weeks in a dark place, systematically shaking. Cook syrup of water and sugar (500 g sugar - 1 glass water) and add it to the tincture of vodka and chocolate. Filter the liquor and bottle it bottles. Chocolate homemade liqueur needs to steep for 3-5 days. This recipe is especially noted for its ease of preparation. To make egg liqueur with your hands, grind 8 egg yolks with 500 g of sugar, add the yolks 200 ml of alcohol and mix. Pour in the mixture a glass of thick cream, add 500 ml milk and a pinch of vanilla. Whisk all the mixer and pour the liqueur in glass bottles. Cap the container and let the egg liqueur to infuse in a cool place for 2 months.